The 2015 Paris World Championships saw the crowning of a new star as the yearling colt, AJ Azzam, took his third consecutive Gold Championship at a title show. This meant that he was the latest in an illustrious line of names to be added to winners of the European Triple Crown, an achievement that can only be done when the horse wins at the All Nations’ Cup, the European Championships and the Paris World Championships all in the same season. Since 1994, only 17 horses have won this coveted title – with Azzam being the 17th. Read on to find out more about this superb young colt, proudly owned and bred by the Ajman Stud in the United Arab Emirates. Dreams came true in Paris for HH Sheikh Ammar bin Humaid Al Nuaimi, owner and founder of the Ajman Stud, and his connections in Paris as the then yearling colt, AJ Azzam, was called forward, not only as Gold Yearling World Champion Colt, but also as a European Triple Crown winner. Bred at the famed Ajman Stud, owned by HH Sheikh Ammar bin Humaid Al Nuaimi, AJ Azzam was foaled in 2014. While the Ajman Stud is renowned for its incredible mares, in Azzam’s case, it is the sireline that is so important to all at the farm. For his grandsire was none other than the late, great Vervaldee (Versace x Giavanna by NV Beau Bey out of Precious as Gold). Vervaldee, foaled in the US, imported to Tucana Arabians in the UK, and then to the Ajman Stud, had a huge impact on the farm. His progeny have excelled in both the show-ring and the breeding barn. Indeed, the influence of this great stallion is something that deserves to be covered in full detail in another edition but for now, we will look at his son, AJ Mardan, and in turn, AJ Azzam. AJ Mardan is a tall, rangy stallion and sire of AJ Azzam. He has won countless titles across Europe and the Middle East, including the first Yearling Colt Championship at the All Nations’ Cup as well as Gold in Ströhen, and his winning ways continued. From his first foal crop came AJ Azzam and in October last year, AJ Nurai, a full sister, was born. 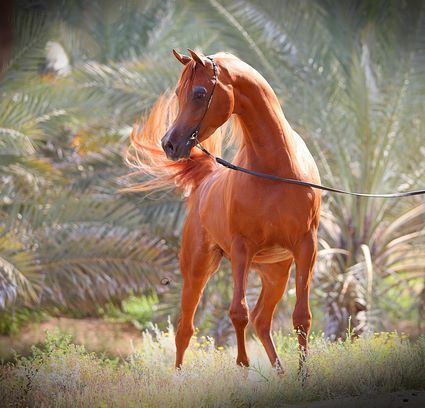 Mardan’s dam is the ethereal beauty, Felicia RLC (Shael Dream Desert x Camelia K by Donatello K out of Cameo Bey), Scottsdale Reserve Champion Junior Filly and Arabian Breeders’ World Cup Champion Junior Filly in 2010. 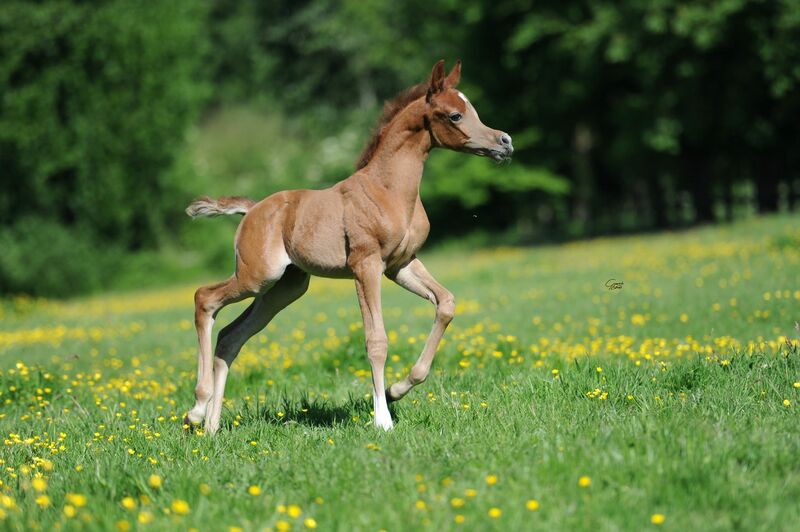 As a two-year old, Mardan was bred to Ysadora (Marwan Al Shaqab x Ysabela by Parys El Jamaal out of EA Moongyspy Echo) and the resulting foal was AJ Azzam. From the moment he was born, those close to the stud recognised a sense of his paternal grandsire in him, and immediately Azzam began to fill the huge hole left at the farm when Vervaldee passed. In early 2015, AJ Azzam quietly made his show-ring debut. His first show was at the Tulip Cup and he left as Silver Yearling Male Champion. This would be the only blot on the landscape, however, as Azzam would go on to strike gold at every other show he contested. 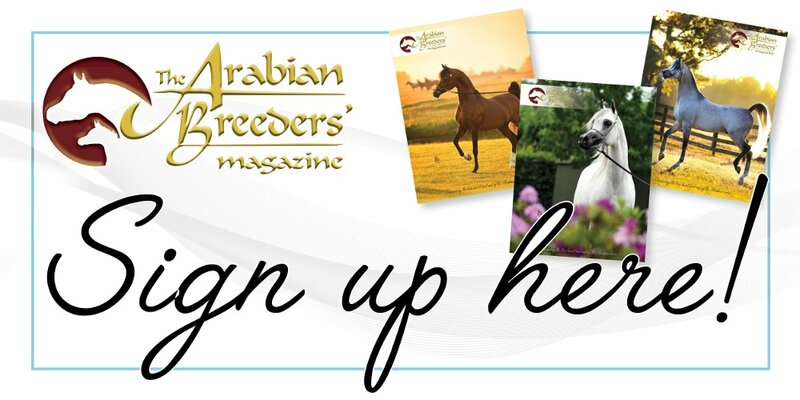 At the Wels International Show, the Bruges International Show, the Elran Cup, and Al Khalediah European Arabian Horse Festival, Azzam won both his class and the Gold Championship at each event. The end of September saw Azzam contend the first of the Triple Crown shows, going to the All Nations’ Cup in Aachen. There, he won the Yearling Colt Championship in style and he would go on to repeat the success at the European Championships, last year held in Verona. AJ Mardan (Vervaldee x Felicia RLC. From there, Paris beckoned. The Salon du Cheval World Championship, held in the city of lights, could be the show that would propel AJ Azzam into the spotlight and garland him in the most golden title of all – that of European Triple Crown winner. AJ Azzam is an incredibly pretty colt. He has great charisma and a naturally showy nature, and it will be fun to see him develop over the coming years. In 2015, Azzam dominated the European show scene, and with AJ Nurai waiting in the wings to debut this year, we can expect more of the AJ Mardan progeny over the coming years. One thing is for sure – the Vervaldee influence is one that will endure down through the generations and, at the moment, AJ Azzam is the brightest of all the young stars from this family. Surely more, much more, is yet to come.